Bake potatoes until they are fork tender, cool to the touch and peel. On a floured surface, rice the potatoes. You can mash with the tines of a fork, but a ricer lets in air and makes it fluffy. Make a well in the potatoes and add your eggs, cheese, salt and pepper. Now start adding 3/4 of a cup of flour and begin to mix. The dough should be a little tacky to touch, but it should form to make a soft smooth ball so keep adding flour until this happens. Now let rest. I will give you the ingredients for the Ricotta Gnocchi now because the method is the same for both. Make a well in the ricotta and add your egg, cheese, salt and pepper. Now start adding 1 cup of flour and begin to mix. The dough should be a little tacky to touch, but it should form to make a soft smooth ball so keep adding flour until this happens. Now let rest. Cover dough with cling wrap and a dishtowel to prevent it from drying out and let it rest for 15 minutes to a few hours. Divide the dough into manageable pieces; Suzie divided the dough into eighths. Take each piece on a floured surface and roll into logs that measure between a 1/2 and 3/4 inch. There is no need to measure. Cut the logs into 1/2- to 3/4-inch pieces using a sharp knife and cutting quickly so as not to mash the log. 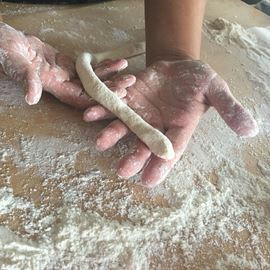 Here are a few options: My nonna uses the base of a wicker basket and rolls the gnocchi against this to create her ridges, always using a thumb or middle finer, never the index because it is too small. Suzie had this gadget we both did not like as the gnocchi stuck to it and the ridges were not deep enough or use the tried and true method of the back of a fork. Place the gnocchi on a floured surface and covered until ready to use. A little tip: gnocchi freezes well so make a big batch. Freeze them on the cookie sheet. Once frozen, place them into a freezer bag and store for up to one month. Gnocchi are just like fresh pasta. They are happiest in heavily salted water and they are done when they float to the surface. Also, like pasta, gnocchi likes any and all sauces. Suzie made a rich, delicious 7-Hour Meat Sauce for the potato ones as they stand up well in a heavy sauce. Place the meat in a dry pot and cook until it is brown on all sides. It will stick and this is what you want because you are creating flavour. Remove the meat to a plate, add the olive oil and onion and cook until the onion is soft. Remove the onion and add the garlic and oregano, cook for one minute and add back to the pot the meat. Now I love the onion so I would add it back in, but Suzie’s Nonna did not so it’s your choice. Cover the meat with the wine and passata, add the basil, salt and pepper to taste and simmer forever with the lid on to keep in the moisture. If at any time the sauce seems to be drying up, you can always add broth, wine or more passata. In a saucepan add cream and heat gently, add the cubes of cheese stirring with a wooden spoon until melted. Once melted add parmigiano, salt and pepper and let simmer until reduced by a quarter and slightly thickened. Set aside. In a small frying pan melt butter until bubbling; add sage leaves and fry until crisp. Set aside. Boil gnocchi. Once it’s cooked, add it to the pan of sauce and simmer for a few minutes, tossing until the gnocchi and sauce are harmonious. Place in a warm serving dish, garnish with raw radicchio and sage leaves. As we are cooking, we are chatting. Suzie starts to tell me how she fell in love with cooking. Suzie dreamt of being a doctor until she heard people died. Yes, we all know we die, but that is different from being close and treating people. Once that dream was out of the way, her true dream emerged. Suzie was wrapped in a home of great cooks and gardeners; Suzie watched her Nonna roll dough, while her other nonna had a history in butchery braise meat and her mother was a master of both. Suzie herself fell in love with dough, sweet and savoury. Gnocchi are a ton of fun to make and you can’t really mess up. It is fun to do with kids, friends, whoever you can round up. Suzie and I had a ton of fun and toward the end we wanted to play just a bit more and instead of rolling the dough into logs we rolled it out into a sheet and cut it into big squares and boiled. They, too, were delicious. These days spent with people who embrace their cultures and heritage, but also like to leave their own mark are a treasure I will always keep close to my heart. Sunny or rainy, hot or cold there is always a great time to get into the kitchen, share stories, cook and learn.